All lightning charger cable support IOS10,all phone cable Charger for iPhone X/8/8 Plus/7/7 Plus/6/6 Plus/6S/6S Plus/5/5S/SE,iPad Air 1/2,iPad mini 1/2/3,iPod nano7,iPod touch and more device. 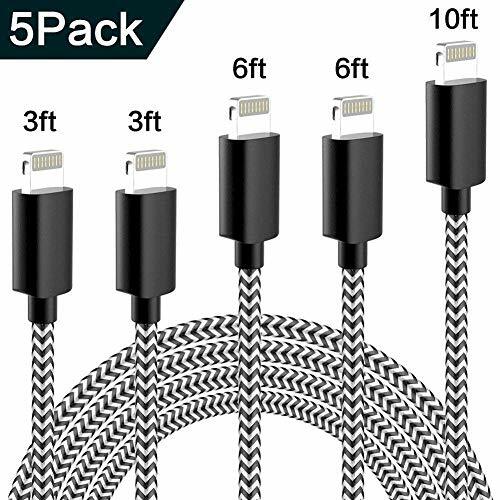 ❤ What you get: 5 pack lightning cable in assorted Lengths (3FT,3FT, 6FT, 6FT, 10FT) for different occasions. ❤ [Nylon Braided]Highest standard of quality cables, covered by premium quality braided nylon,jacket.Flexibility, durability, portability of cable in daily what kind of scene, also can connect, use very convenient. If you have any questions about this product by ZestyChef, contact us by completing and submitting the form below. If you are looking for a specif part number, please include it with your message.